The 10th annual National Pollinator Week ends Sunday, June 25, and what an opportunity it's been to showcase our pollinators! As noted entomologist May Berenbaum pointed out, it's "a celebration of Earth's 100,000-plus animal species that, by transporting pollen and facilitating flower fertilization, make life possible for two-thirds of the world's flowering plants." 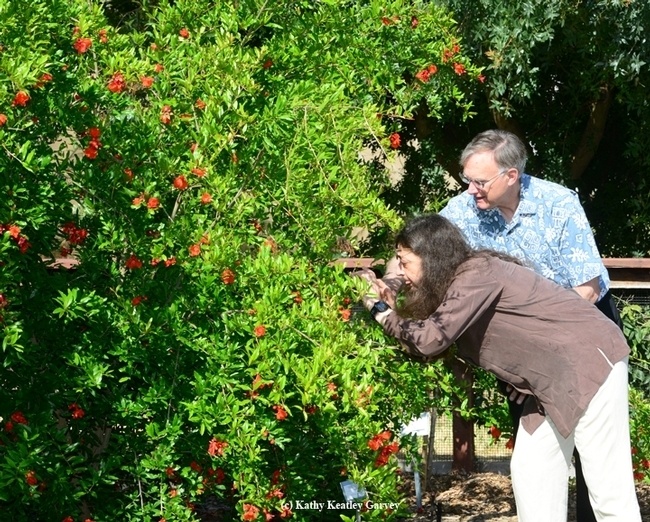 Berenbaum wrote an excellent pollinator piece posted yesterday on the National Academy of Sciences' Facebook page. It bears repeating. Berenbaum, professor and head of the Department of Entomology, University of Illinois, Urbana-Champaign, and a past president of the Entomological Society of America, related: "Not entirely coincidentally, 2017 is an anniversary for the National Academies of Sciences, Engineering, and Medicine—it's the tenth year since the publication of the Committee on the Status of Pollinators in North America report, a committee I chaired." "My association with pollinator issues goes back to 2004, when, as Chair of the Board of Agriculture and Natural Resources, I was an outspoken advocate for a study to determine whether North America's pollinator species were declining, as appeared to be happening elsewhere in the world. The committee released its findings in October 2006, among the most striking of which was a decline in the numbers of commercial honey bees such that, were the trend to continue, the U.S. apiculture industry, on which producers of over 90 crops depend, 'would vanish by 2035.' In a remarkable confluence of events, that same month, the first reports of what was later dubbed Colony Collapse Disorder (CCD) surfaced; bees literally began vanishing, abandoning depleted, doomed colonies. Concern in the agricultural community and then the general public escalated and has remained high ever since. So, sadly, have losses; although CCD itself has declined, in the past year America lost one-third of its commercial colonies." The honey bee genome sequencing project, headed by NAS member Gene Robinson, was completed in October 2006, the same month the committee released its findings. Wrote Berenbaum: "The genome provided brand-new insights into potential vulnerabilities of honey bees—a paucity of genes relating to immunity and detoxification, possibly rendering them particularly susceptible to parasites, pathogens, and pesticides. 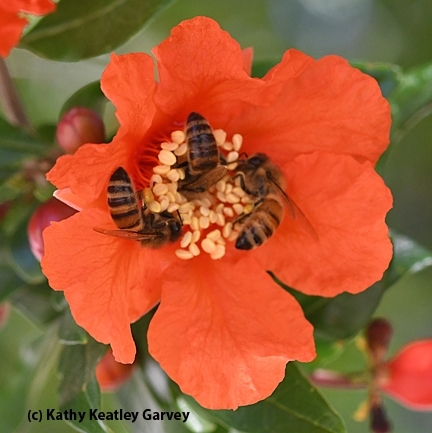 Fortunately, the genome also provided powerful tools for studying honey bees and their relatives. In September 2007, the first 'genome-enabled'' study was published, identifying a honey bee virus new to the USA; since then, hundreds of genome-enabled studies have expanded knowledge of basic honey bee biology and introduced methods for monitoring and improving honey bee health. How honey bees cope with pesticides has been a focus of my own research for a decade, a pursuit that wouldn't have been feasible without genomic tools." "The 2007 report also concluded that, unlike honey bees, population data for thousands of America's native pollinators (including its 4,000 native bee species) were sorely lacking and called for increasing efforts to engage the public in documenting, mitigating, and reversing declines," Berenbaum noted. "Since then, many data gaps have been filled and conservation strategies implemented. In 2014, President Obama prioritized a national strategy to promote pollinator health, including public-private partnerships to restore pollinator habitat." This year the rusty-patched bumblebee "became the first continental bee to be protected under the Endangered Species Act," Berenbaum wrote. Let's hope there will be many others. 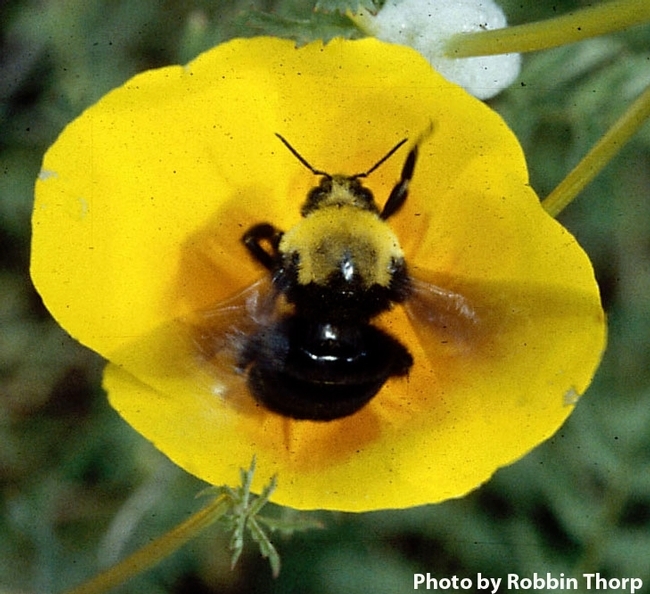 Background on the rusty-patched bumble bee: Among those credited with sounding the alarm was Robbin Thorp, distinguished emeritus professor of entomology at UC Davis. It was a long, dedicated and challenging effort by many people who care. In 2010 Thorp co-authored a petition sent to the Xerces Society for Invertebrate Conservation. The petition was submitted to the U.S. Fish and Wildlife Service in 2013. In 2015, agency officials agreed to consider it. In 2016, they proposed protection. Then on Jan. 10, 2017, the agency listed the rusty-patched bumble bee as an endangered species. Other key players in making this all happen included natural history photographer/filmmaker Clay Bolt and his friends at the Day's Edge Productions, which created the award-winning film, A Ghost in the Making: Searching for the Rusty Patched Bumble Bee with support from the Xerces Society and others. 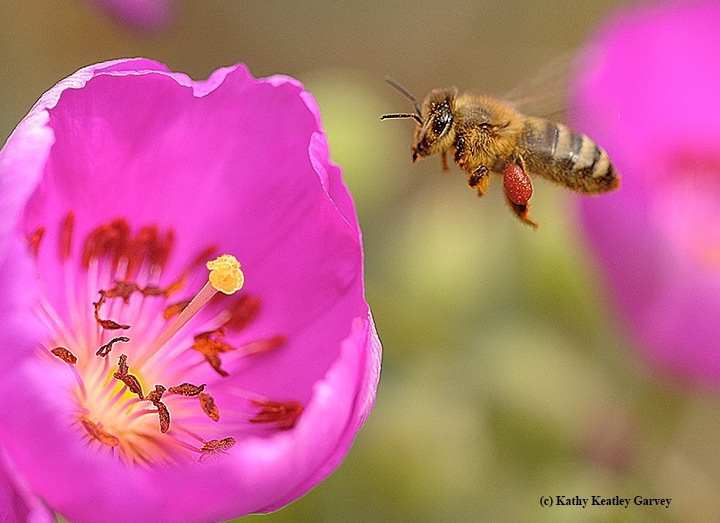 The result: nearly 200,000 persons signed a petition seeking endangered status for the bee. Thorp, co-author of Bumble Bees of North America, An Identification Guide. 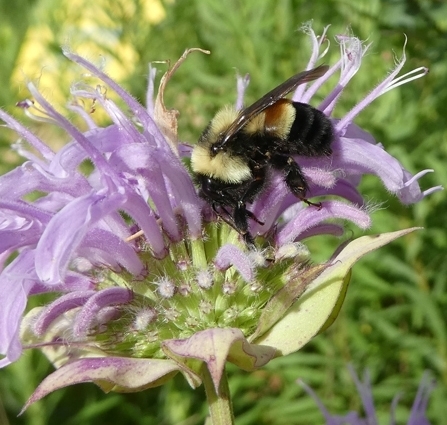 continues to sound the alarm on the declining bumble bee population, especially Franklin's bumble bee (Bombus franklini), found only in a five-county area of northern California and southern Oregon. Thorp helped place Franklin's bumble bee on the Red List of Threatened Species of the International Union for Conservation of Nature and Natural Resources (IUCN). "Bombus franklini occurs only in the USA," IUCN relates. "It is found only from southern Oregon to northern California between the Coast and Sierra-Cascade Ranges, in Douglas, Jackson and Josephine and Siskiyou and Trinity counties in Oregon and California, respectively. This area is around 190 miles in the north-south direction (40º58' to 43º30'N latitude) and 70 miles from east to west (122º to 124ºW longitude)." Franklin's bumble bee is named in 1921 for Henry J. Franklin, who monographed the bumble bees of North and South America in 1912-13. During its flight season, from mid-May through September, Franklin's bumble bee frequents California poppies, lupines, vetch, wild roses, blackberries, clover, sweet pea, horsemint and mountain penny royal. It collects pollen primarily from lupines and poppies, and gathers nectar mainly from mints. 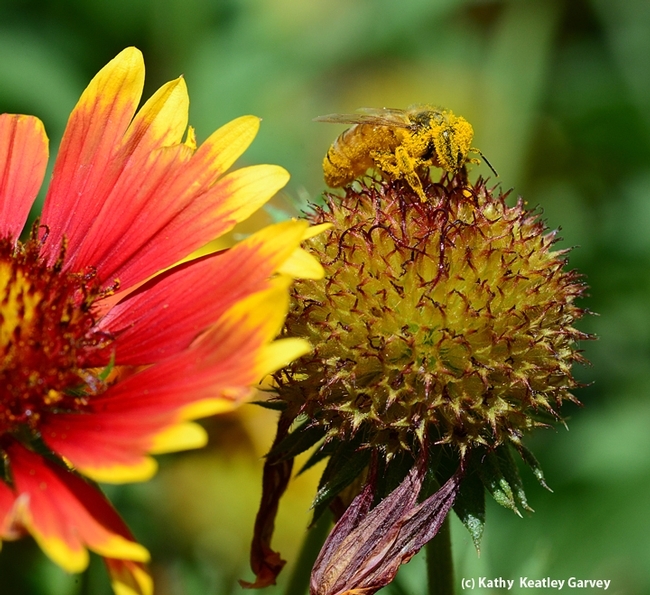 As the end of the 10th annual National Pollination Week nears, there is so much more to be done to understand, protect and celebrate our pollinators to ensure that they don't "end." As May Berenbaum said: "A week hardly seems long enough for the celebration!" That's the consensus of the declining honey bee population in the United States. A newly released poll showed that our nation's beekeepers lost an average of 21 percent of their colonies last winter, as compared to 27 percent the winter before, according to the 11th annual survey conducted by the Bee Informed Partnership. They polled nearly 5000 beekeepers. Nino, who was not part of the survey, added “I am glad to see this, but wouldn't celebrate too much yet." Survey director Dennis vanEngelsdorp. a University of Maryland apiculturist, told the Associated Press: "It's good news in that the numbers are down, but it's certainly not a good picture. It's gone from horrible to bad." Indeed, the 10-year average for winter losses is 28.4 percent, and bee scientists want it down to at least 15 percent. Pests, pesticides, diseases, stress and malnutrition all play a role in our nation's honey bee population decline. Eric Mussen, Extension apiculturist emeritus, who retired in 2014 after a 38-year career, has long pointed out the malnutrition issue is a major factor in the declining bee population. 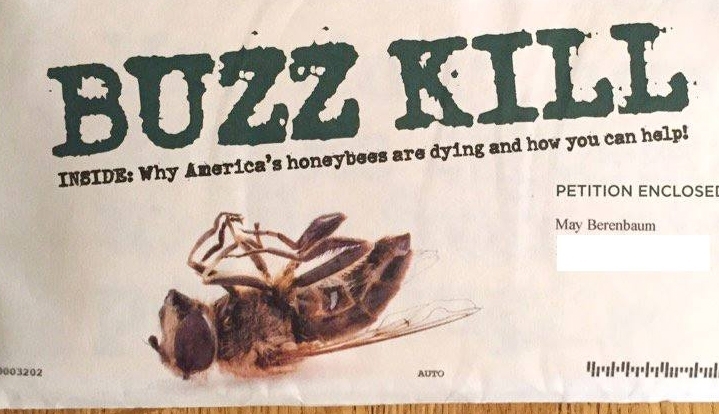 "You, no doubt, have lost track of how many times I have stated that malnutrition is a leading factor in our unacceptable annual bee colony loss numbers," Mussen wrote in a 2013 bimonthly newsletter, from the UC Apiaries, located on the Department of Entomology and Nematology website. "I have also stated innummerable times that our synthesized bee diets just cannot match the value of nutrients obtained by bees from a mixture of quality pollens. My concern has been that although we have a very good idea of the protein requirements for honey bees, the rations of essential amino acids honey bees require, and their required vitamins and minerals, etc., we still cannot feed bees on our best diets and keep them alive more than two months in confinement." Malnutrition is linked to a number of factors, including loss of habitat, but also climate change. Scientists believe that our rising carbon dioxide levels may contribute to die-off of bees. A May 2016 Yale publication warned that "Rising C02 Levels May Contribute to Die-off of Bees." 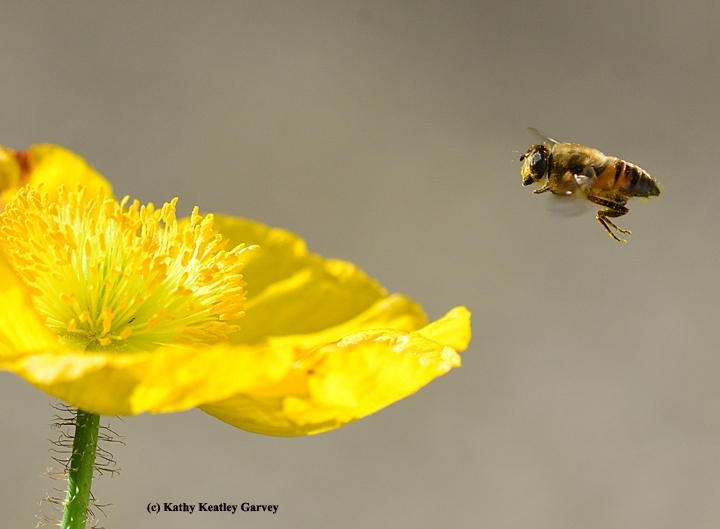 "As they investigate the factors behind the decline of bee populations, scientists are now eyeing a new culprit--soaring levels of carbon dioxide, which alter plant physiology and significantly reduce protein in important sources of pollen," wrote Lisa Palmer. This is the gist of it: scientists headed over to the Smithsonian National Museum of Natural History to examine the pollen content of goldenrod specimens, dating back to 1842. Why goldenrod? It's a key food source for bees in the summer to late-fall bloomer when not much else is blooming. They compared samples from 1842 to 2014, when atmospheric concentrations of carbon dioxide rose from about 280 parts per million to 398 pmm, and found the results quite troubling--a lot less protein in the pollen of newer specimens. In fact, the most recent pollen samples contained 30 percent less protein. "The greatest drop in protein occurred from 1960 to 2014, when the amount of carbon dioxide in the atmosphere rose dramatically," Palmer wrote. Scientists speculate the rising carbon dioxide concentrations--think climate change--may be playing a role in the global die-off of bee populations "by undermining bee nutrition and reproductive success," Palmer wrote. Noted entomologist May Berenbaum, professor of entomology and head of the Department of Entomology at the University of Illinois at Urbana-Champaign (she's now a past president of the Entomological Society of America) was quoted in the article: "A declining quality of protein across the board almost assuredly is affecting bees. Like humans, good nutrition is essential for bee health by allowing them to fend off all kinds of health threats. Anything that indicates that the quality of their food is declining is worrisome." So honey bees--which pollinate about one-third of the food we eat--are still in trouble. And so, it appears, are we. 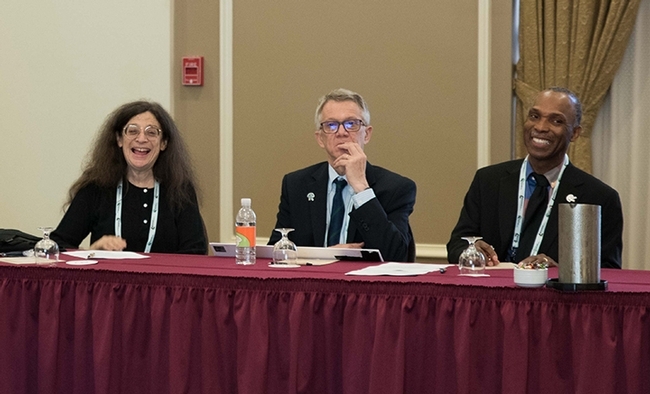 That was one of the questions that the UC Davis Linnaean Games Team answered correctly at the championship finals during the 2016 Linnaean Games, hosted recently by the Entomological Society of America (ESA) in Orlando, Fla. 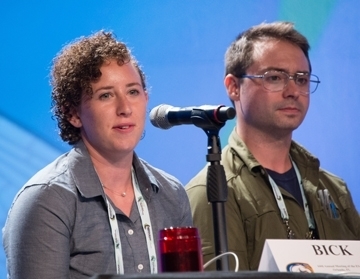 The UC Davis team of captain Ralph Washington and Brendon Boudinot, third-year graduate students, and Emily Bick, a second-year graduate student, successfully defended their national title, defeating the University of Georgia (the national champion in 2012), by the score of 145 to 55. 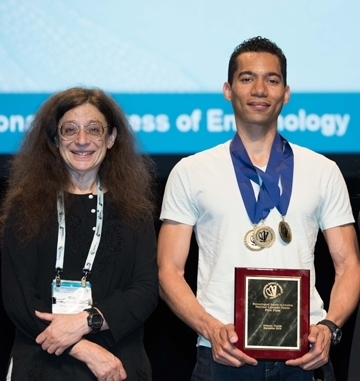 The UC Davis entomologists earlier outscored Ohio State University, North Carolina State University (champions in 2014), and Texas A&M in advancing to the finals. Congratulations, UC Davis! And well done, all other teams! The ESA Linnaean Games are a lively question-and-answer, college bowl-style competition on entomological facts played between university-sponsored student teams. The teams score points by correctly answering random questions. The winning team receives a trophy cup for the department, and each individual, a plaque. 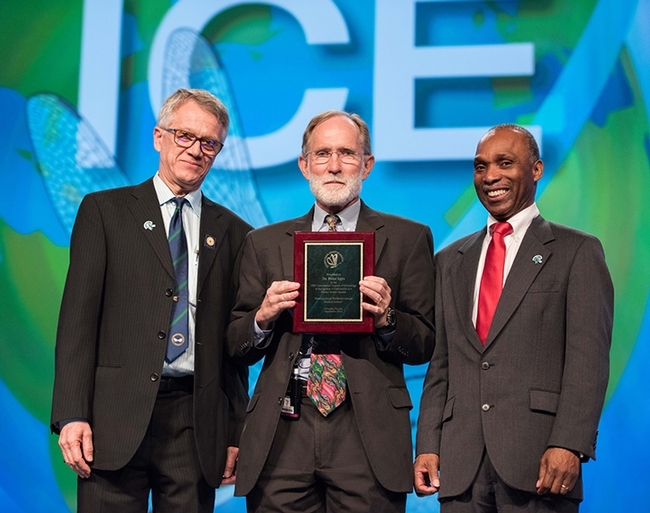 About the trio: Washington is studying for his doctorate with major professors Steve Nadler and Brian Johnson, who respectively specialize in systematics and evolutionary biology of nematodes and the evolution, behavior, genetics, and health of honey bees; Boudinot with major professor Phil Ward, systematics and evolutionary biology of ants; and Bick, with major professor Christian Nansen. Bick is working on ecosystem models to optimize pest management in two systems: invasive aquatic weed species water hyacinth and its biological control agent, Neochetina bruchi; and working to control Lygus bugs using alfalfa as a trap crop in strawberries. 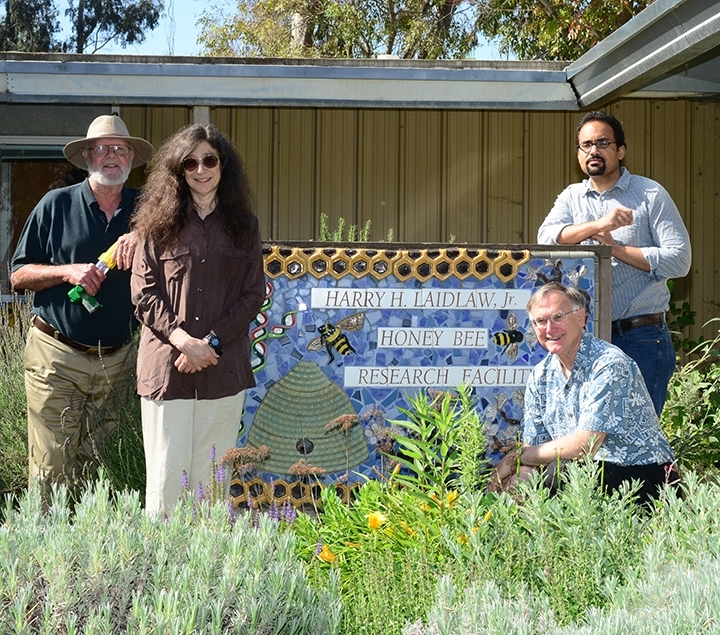 UC Davis Extension entomologist Larry Godfrey serves as the team's advisor. So, what's the answer to the question about pets in the apartment? Insects inhabiting a very thin water film such as splash zones marginal to streams are called what? The insect order Notoptera unites what two former insect orders? 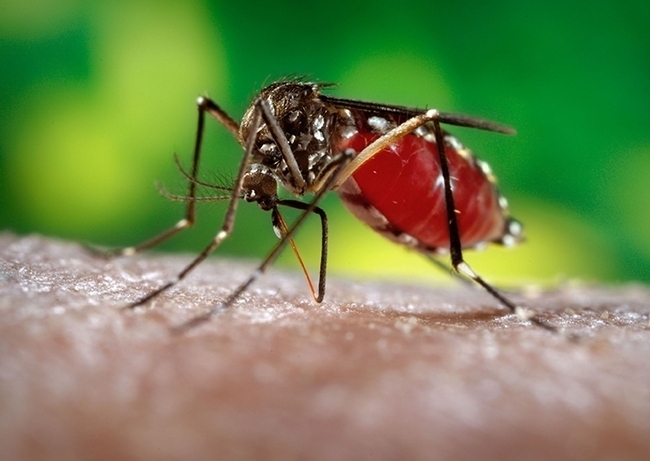 What are the two obvious clinical symptoms that someone is suffering from onchocerciasis? What is the common name for the zygentoman pest that thrives in high humidity and high temperatures and is often found in boiler rooms? Projection neurons travel across what two major regions of the insect brain? ESA will soon post a video of the championship round. 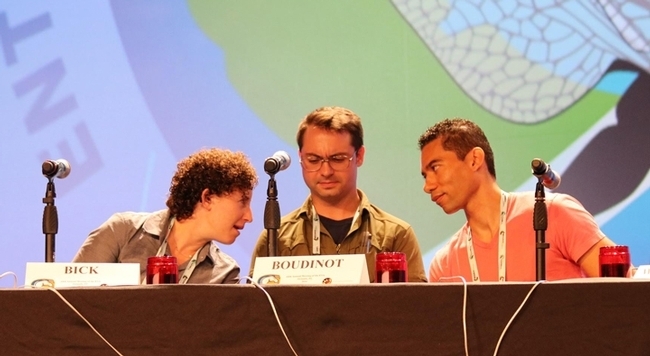 Meanwhile, watch the 2015 championship round (UC Davis defeated the University of Florida). The knowledge of both teams will amaze you. Blindness and hanging tissue around lymph nodes, often times the scrotum. You answered them all correctly, right? This is the envelope that May Berenbaum received asking her to help the honey bees. This is a photo of a fly. She later quipped that at least no bees were harmed in the making of this graphic. If poet Gertrude Stein were alive today, she might say "A bee is a bee is a bee" instead of "a rose is a rose is a rose." Or, she might say "A fly is a fly is a fly." That's because major corporations, news media and people-who-should-know-or-who-should-at-least-fact-check are still confusing honey bees with flies. May Berenbaum, 2016 president of the 7000-member Entomological Society of America (ESA) and a National Medal of Science recipient, recently received a solicitation letter from a well-known nature corporation asking her to help the honey bees. All's well and good, right? Wrong. The photo on the envelope was not of her beloved honey bee. It was a photo of a fly. A syrphid fly. Never send a fly to an ESA president, the top of the entomological chain, and claim it's a bee. Apparently this corporation--okay, the Sierra Club, as this is all over the Internet--obtained the "bee" photo from someone who could not distinguish certain species in the order Hymenoptera (which includes honey bees) and the order Diptera (flies). The drone fly, Eristalis tenax, is often confused with the honey bee, Apis mellifera. To entomologists, it's like confusing an elephant with a giraffe. Berenbaum, who also has a keen sense of humor, posted a blurb on her Facebook page about the fly. Is there a syrphid that mimics a honey bee? Maybe they fell for it. That is so terrible it's almost wonderful. Personally, I'm wondering who the heck is taking all of the pictures of syrphids!! Aren't bees a lot more common? I may have to use this in my next lecture about mimicry and how successful it can be, even against visual-based predators. May and I were close friends in high school and, I'm pretty sure that she is the smartest person I've ever met. Well, Eristalis tenax is just such a great mimic, I am proud of that species! I see images of bumble bees with "Save the Honeybee" on stickers. Kind of like "Save the Cow" with a picture of a bison, or worse. How to offer professional advice/fact checking for articles/media? Would love to do it! That's funny and sad at the same time! There are so many syrphid photos that have been used as bees, I begin to wonder if most people really don't know what bees look like! So we were sitting at the dinner table and a friend said "If only someone was running for president who was worth voting for." Without missing a beat, my daughter said "What about May Berenbaum?" You've now been duly nominated.